A couple months ago, I started feeling a little tired of shooting the same old things, so my AWESOME wife Emily convinced me to plan an epic photography trip to reignite my passion (it took her about 3 seconds to convince me). I asked the ImprovePhotography community on our Facebook page where in the United States I should go. The consensus was Yellowstone, so I booked a hotel and a guide. There was just one problem. I wanted to photograph wildlife on this trip, and I wanted to do it with the best wildlife lens possible–The Nikon 600mm f/4 lens. The problem? It's a $12,000 lens and I don't have as much money in my sock drawer as you might think. Borrowlenses.com came to the rescue! Renting a lens is perfect for special shoots or when you want to try a new lens before buying. I left Blackfoot, Idaho at midnight last night and drove 6 hours to Gardiner, Montana which is the nearest city to the north entrance of Yellowstone. The drive over here was C-O-L-D and icy on the roads. I looked down at the car's dashboard at one point and noticed that the outside temperature was -3 degrees (see the picture for photographic evidence). 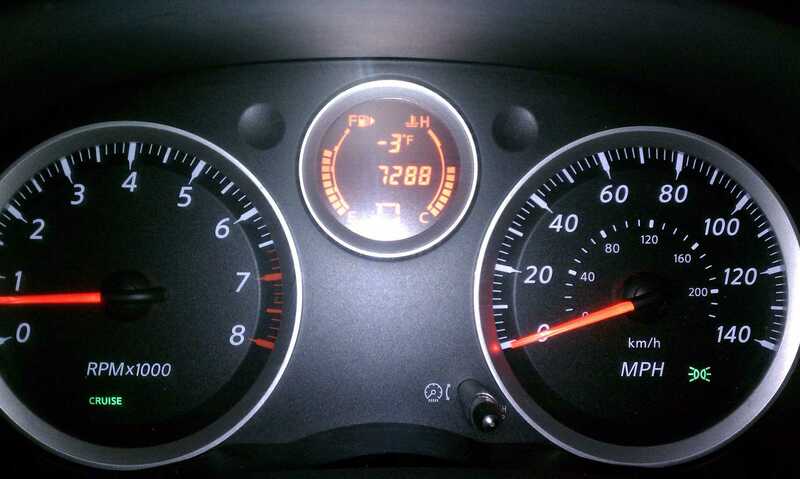 A little later on the drive, it hit -8 degrees farenheit (-22 celsius), but I didn't get a picture of it…. The North entrance is the only publicly accessible entrance during the winter months. 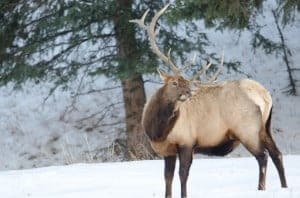 I hired a private guide to get me close to the animals, and I have to give my highest praise to Yellowstone Glacier Adventures for doing such a terrific guide. He was amazingly knowledgeable and knew exactly where to take me to get close to the animals. After entering Yellowstone National park, our guide spotted the remains of an elk that had been killed by predators the previous day. We drove up near the road and waited, hoping to see one of North America's most elusive animals–the wolf. After a short wait, I spotted a giant wolf come through the bushes and work its way toward the carcass. It was 7AM and still extremely dark. Nikon D7000, Nikon 600mm lens with Nikon TCII-E 1.4 teleconverter, f/5.6, ISO 6,400, shutter speed 1/50. Noisy and uninspiring photo, but a really cool thing to see. I could barely make out the shape of the wolf in the viewfinder, so I cranked the ISO on my D7000 to 6,400. I realize that the D7000 produces an extremely noisy picture with that high of an ISO, but I had no other choice. 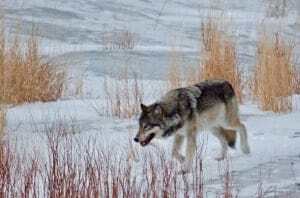 I just needed some sort of proof that I actually saw a wolf, otherwise you guys wouldn't believe me. So, here's the shot of the wolf. Seeing the wolf was an amazing highlight, but I knew the photo was unusable since it was so noisy. So, on we (I say “we” because my brother-in-law was kind enough to come with me) went. A little bit up the road, we saw a gorgeous coyote in full winter fur. Coyote are beautiful in the winter months, but they lose much of their fur during the summer and don't look as pretty. Unfortunately, the coyote was a bit too wily…. I couldn't get a shot of him. The next animal we spotted was a giant 6×6 bull elk. I shot this elk for about 20 minutes before I finally gave up. He was in a shadow, so it was tough to do anything great with such dull light. Still, it was fun to photograph the elk for a while and watch such a powerful animal. When I first spotted the elk, he was lying down on a ridge about 200 yards (182 meters) away. Shooting the elk lying down didn't create a very dramatic shot, so I stayed there in the freezing cold waiting for the elk to stand up. He was stubborn for quite a while, but eventually stood up when a bus drove by on the nearby road and scared him. I shot about 50 frames of the elk in 60 seconds of him standing before he disappeared behind a ridge. I was really fortunate to see a red fox near the elk. 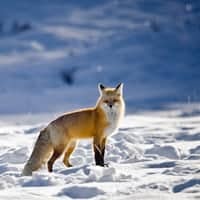 The little fox was out in a field of fresh-fallen snow that glistened in the afternoon sunlight. With the Nikon 600mm lens and the 1.4 teleconverter, I was able to get some great shots even though the fox was a fair distance away. What I learned from shooting this red fox is that sometimes including the environment is the best way to showcase an animal in a photograph. A tightly cropped in photo of this same fox looks lame, but I personally like this one that shows more snow. 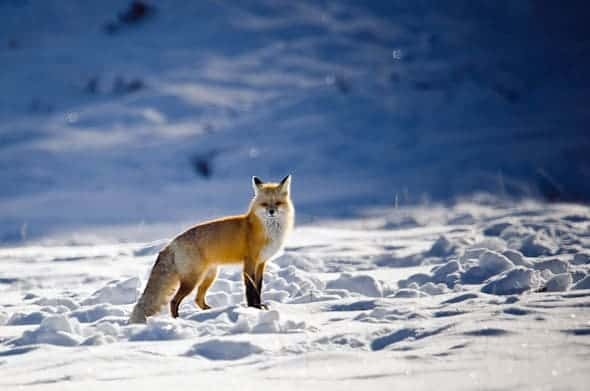 It makes the red fox really pop when juxtaposed against the natural blue shadows of the snow. 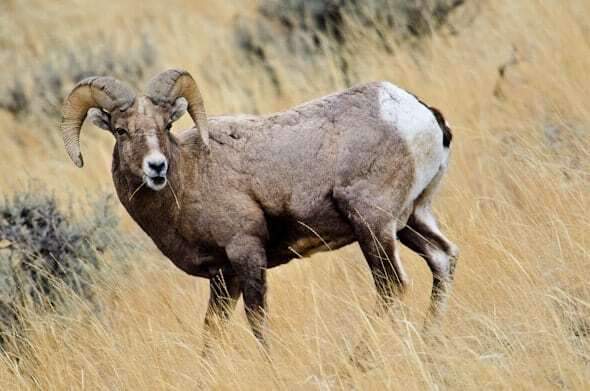 The daylight started fading away soon after I photographed the red fox, but I really wanted to try and find a ram (male bighorn sheep). We drove down to an area where our guide knew there were rams, and we eventually spotted one on a distant ridge. We drove around and eventually parked on the side of the road with 75 feet (29 meters) between us and the rams. Shooting the ram pictured below was definitely a highlight of the day. He stood there and posed for me for a long time before finally taking off over the ridge. I shot about every conceivable angle of the ram and still couldn't decide which one was best while post-processing, but the one below is one of my favorites from the shoot. Nikon D7000, Nikon 600mm lens with 1.4 teleconverter, f/5.6, ISO 800, 1/200th second shutter speed. Tomorrow I'll post another update with some of the images I capture as I travel through Yellowstone during the winter. Hope you all like that post as well.